Combat of Giants: Dinosaurs 3D is a game that takes place on a more ancient Earth where dinosaurs rules and battled their way to supremacy. There are four groups of dinosaurs for players to choose from, each with their own distinct look and feel; Predators, Hunters, Defenders and Chargers. Each group has their own subset of dinosaurs from players to choose from and each group has its own particular advantages. The game also has an extras area to view things that you have unlocked; as well as other things, like streetpass, credits and a trade menu. Combat of Giants: Dinosaurs 3D’s story is that basically an evil Arkosaurus is threatening the land and it’s up to the player to gather a party of dinosaurs to take into the Arkosaurus’ lair and end its evil scheme. Well, at least that’s what I assume is happening. The Arkosaurus’ plot is never really delved into aside from a few lines to let you know that he is evil. Primeval Earth, 15o million years ago. The dinosaur races shared the ancient land respectfully. Under the protection of the four great chiefs, the fury of the Arkosaurus was contained. Contained you say? How is that he broke out? One day, unforeseen cataclysms struck the land. The four great chiefs disappeared and the Arkosaurus seized power, rallying the tribes of malevolent dinosaurs. The world stood on the brink of utter destruction. While the story may be a bit basic, the game is likely to have been developed with children in mind, so any kind of complexity within the story may have been too confusing for younger gamers. Which is a fair call, it’s better to have a basic story that you can get everyone behind, rather than put on a long and convoluted plot involving several teenaged dinosaurs running around a city and having the main protagonist be a fraud and etc. Simple, but maybe too simple. As I said earlier, you’re not really given much backstory to the Arkosaurus, other than he was contained and that he broke out because of a fluke. I would have liked to have seen a little more from the Arkosaurus’ backstory, just so that it would make it easier to get on board with killing him later. This is all done on the + pad. Touch screen is a no go. 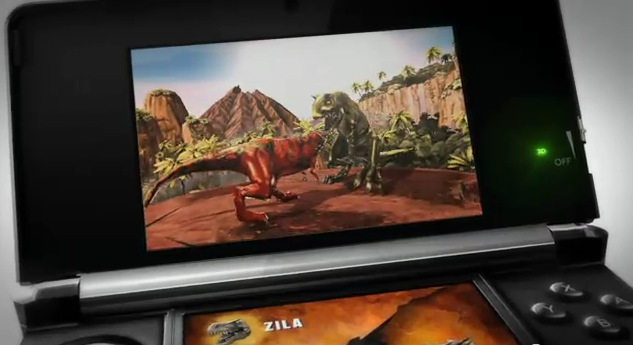 The gameplay in Combat of Giants: Dinosaurs 3D is quite basic, but that doesn’t mean that it’s bad. Essentially players need to guide their selected dinosaur down a linear path and battle 4-5 other dinosaurs along the way. These battles are always in sequence and can never be skipped. Between battles, there are generally long stretches of landscape with a handful of breakables that sometimes drop bones or other collectibles as you break them. Along with the breaking of stuff, like dinosaurs bones, sticks and rocks, there are also smaller dinosaurs which you can scare into dropping loot for you to upgrade your dinosaur with. After traversing the long stretches of land between each battle and defeating each opposing dinosaur, you will reach the levels boss and you have to defeat the boss to move onto the next level. Each level in the game is set up the same, start at point a, travel to each new point with a new enemy, kill it, then end up at the end point with the boss and kill that. The levels are set up differently, but I’m sure I noticed that a few environments were seen elsewhere in the game. For instance, for each of the dinosaurs I played as, I passed through a giant tunnel in a desert and a volcanic mountain – with each of them having a layout that was incredibly similar between each dinosaur. I understand when it’s a dinosaur of the same base type (example hunter), but when ones a charger and ones a defender (and each is on a separate continent) it starts to look a little lazy. Though, I must admit that the repetition in environments does not detract from the fun all that much. Each enemy has a particular strategy to them, which the game informs you of for the first time you encounter that particular enemy. While it may seem effective to utilise an enemies weakness, I often found that the weak-point sometimes took a bit long to appear and would switch to a more quicker strategy… such as ramming the enemy off the side of a level. 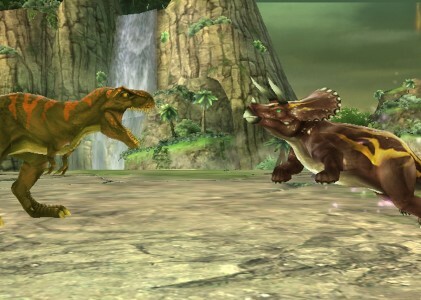 In this game, players battle an enemy dinosaur on a platform with the ends leading off an edge (think Super Smash Bros.) and each combatant must either knock their opponent out, or knock their opponent off. It’s quite simple. There are three types of attacks for players to utilise, which are: basic and rapid physical attacks, charging and a special attack. The physical attacks are where your dinosaur attacks using their own body, charging rams your opponent back; closer to the edge and the special attack is used to deal damage and push your opponent back. I’m assuming that each class of dinosaur, Chargers, Defenders, Hunters and Predators, has their own unique advantages and disadvantages, but outside of movement I haven’t really noticed a difference between them. Speaking of movement, out of all the dinosaurs classes, the only dinosaurs that don’t handle like a school-bus are the hunters. I’m serious, none of the others seem to glide or have any kind of grace in their movement, they move as heavy as they appear to be. Which is both interesting and annoying simultaneously. It’s interesting because it gives you a sense of feel with the dinosaurs, but it can also be annoying because sometimes you’ll miss the thing you’re trying to crush and it takes a little bit of work to back up and try again. The boss fights probably have the strangest difficulty curve in the game, with the first being initially difficult and with subsequent bossed getting easier. That is, until you reach the final boss where it’s back to being tough as nails. While each boss is built to be beaten a certain way, I found it easiest to avoid using the strategy that you’re supposed to use and just went on a more push-back type stratagem. This made the fights terribly easy as it would only take a handful of hits to ring them out as opposed to the whole bunch of hits it usually would have taken to drain their HP to zero. This however almost changes with the final boss battle of the game. The final boss has a much faster rate of attack and much more harder to notice cues as to which attack it is going to be doing next. This makes it hard to dodge it’s attacks which increases the challenge a fair bit. I think this is one of the few boss battles in a game that I have enjoyed in a while, which is something in the games favour. While the boss is hard to work out, once you do, it becomes way easier and is almost simple to pull off. It’s all about learning the moves and then pulling them off one after the other. Overall the gameplay is a bit wavey, but it isn’t to the games detriment. And he’s almost off the edge. Combat of Giants: Dinosaurs features a rather compelling soundtrack and series of effects. I can’t complain about the music or the sounds, which is good. The sound effects in the game sound similar to the way you would expect them to, for instance, stepping on a branch will yield a crunch. The dinosaurs have a particular roar that will let out at certain times, like when a player selects one or when a player hits Y while running around, that sound surprisingly authentic and aren’t irritating at all. Each hit a dinosaur lands on an opponent is greeted with an effect that correlates to that action and seems to fit wonderfully. 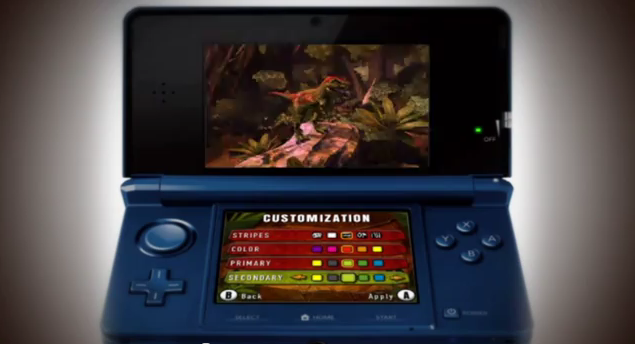 The background music is there usually, with jungle beats and similar music to accompany the gameplay. Though often, it will play at the beginning of the level then kind of just stop. I’m not sure if it’s a bug or expected behaviour, but it suits the game quite well. Somehow it adds a sense of length to what what’s happening, whereas if it was just fast paces, then it would feel much shorter. Open the door; Get on the Floor; Everybody walk the dinosaur! This game has one minor personal gripe with me and that’s with it’s 3D feature. At maximum I found that the 3D effect was too strong for me to handle and too hard for me to focus on. While turning down to 75% or below made it more enjoyable, I feel as though the maximum 3D effect has been aligned incorrectly as I have no problems viewing maximum 3D in other titles. No touch screen support! This game could have made decent use of the touch screen, but I found that I couldn’t even use it for input when naming my dinosaurs… talk about a bit odd. 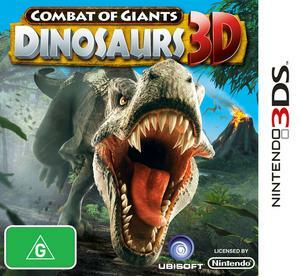 Overall Combat of Giants: Dinosaurs 3D is a rather fun game aimed at a younger audience. It provides a solid amount of time to complete fully, but can also be picked up and played in short bursts. There are also a few extra that can be earned through collecting items which also increases the re-playability of the title. This is a title that I would heartily recommend for parents to get their younger child as it is both enjoyable and challenging. A considerable purchase for any parent.